Cloud computing has transformed people’s perception of how Internet-based applications can be deployed in datacenters and offered to users in a pay-as-you-go model. Despite the growing adoption of cloud datacenters, challenges related to big data application management still exist. One important research challenge is selecting configurations of resources as infrastructure-as-a-service (IaaS) and platform-as-a-service (PaaS) layers such that big data application-specific service-level agreement goals (such as minimizing event-detection and decision-making delays, maximizing application and data availability, and maximizing the number of alerts sent per second) are constantly achieved for big data application workflows. 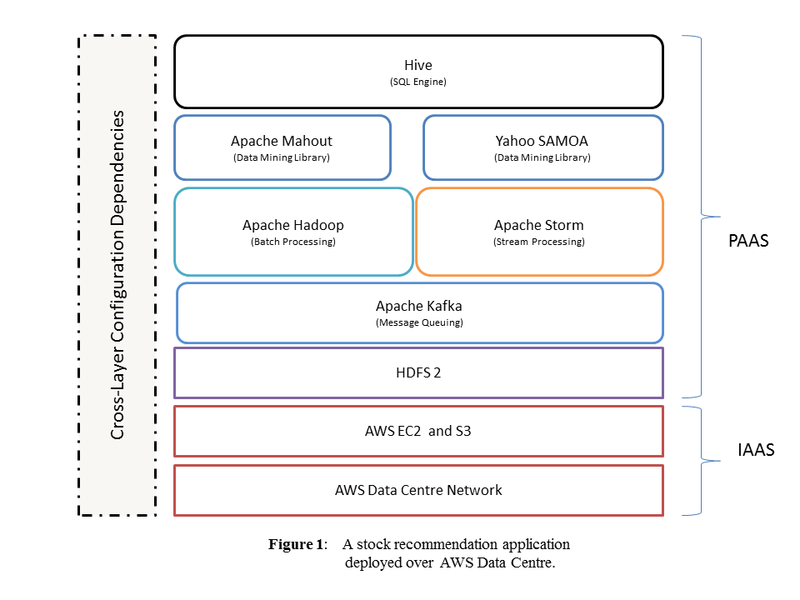 To simplify understanding of the cross-layer resource configuration selection problem, consider a social-network-driven stock recommendation big data application deployed on an AWS datacenter, as illustrated in Figure 1. • the output of both batch and stream analytics subsystems is written to the Hadoop Distributed File System (HDFS). To query the analytics result (for example, the top K most promising stock portfolios), Apache Hive is deployed to support search queries in Standard Query Language (SQL) format. As Figure 1 shows, there are two application management layers in a big data application platform. The first is a big data processing or PaaS framework (Apache Hadoop, Apache Storm, Apache Mahout, and so on) layer that implements software-based data processing primitives (for example, batch processing by Apache Hadoop or stream processing by Apache Storm). In the second IaaS layer, cloud-based hardware or IaaS resources (for example, CPU, storage, and network) provide hardware resource capacity to the higher-level PaaS frameworks. The hard challenge is determining the optimal approach “to automatically select IaaS resource and big data processing framework configurations such that the anticipated application-level performance SLA constraints (for example, minimize event-detection and decision-making delays, maximize application and data availability, and maximize number of alerts sent per second) are constantly achieved, while maximizing cloud datacenter CPU utilization, CPU throughput, network throughput, storage throughput, and energy efficiency. minimizing energy consumption for the datacenter. Existing big data application orchestration platforms (Apache YARN, Mesos, and Apache Spark) are designed for homogeneous clusters of IaaS resources. These platforms expect application administrators to determine the number and configuration of allocated IaaS resource types and provide appropriate configuration parameters for each IaaS resource type and big data processing framework for running their analytics tasks. Branded price calculators, available from public cloud providers such as AWS (http://calculator.s3.amazonaws.com/index.html) and Azure (http://www.windowsazure.com/en-us/pricing/calculator) and academic projects such as Cloudrado (www.cloudorado.com), allow comparison of IaaS resource leasing costs. However, these calculators can’t recommend or compare configurations across big data processing frameworks and hardware resources while ensuring application-level SLAs (such as minimizing event-detection delay).